European rugby returns next weekend, and all eyes will be on champions Leinster. After Ireland's all-conquering autumn, more than ever it feels as if Leo Cullen's men are the team to beat in European rugby's biggest club competition. That is rather stating the obvious, of course. Leinster play the best rugby and have the best players. And, crucially, they can afford to rest the best players. Not one of their stars who played in Ireland's dramatic win against New Zealand in Dublin last month (Leinster provided over half the team, with Cian Healy, Tadhg Furlong, James Ryan, Devin Toner, Josh van der Flier, Johnny Sexton, Garry Ringrose and Rob Kearney all in the starting XV) played in their Pro14 match at the Dragons yesterday. Can anything derail Leinster? I'm not sure. 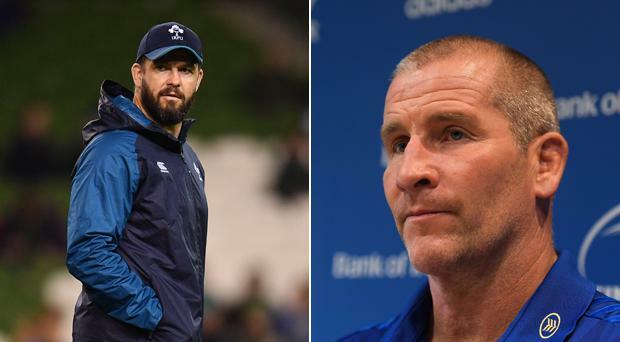 But one thing which might alter the dynamic just a little bit - albeit not this season - would be if senior coach Stuart Lancaster joined Andy Farrell at Ireland after next year's World Cup. The announcement that Farrell is to succeed Joe Schmidt post-Japan 2019 is a fascinating development and I am intrigued to see how it all plays out. It is clear he is part of a very positive coaching environment that has been built up around the provinces and the national team. He lacks experience as a No 1 but you only need to listen to the players with whom he has worked to realise the esteem in which he is held. Remember, he has two Lions tours with Warren Gatland under his belt. Warren always holds on to good people. The big question is who he might bring in to work under him. Could the IRFU possibly extend an invitation to Stuart, who has reinvented himself so successfully at Leinster? I can see it happening. Stuart is already under an IRFU contract. The powerbrokers within Irish rugby, not to mention the players with whom Stuart works at Leinster, clearly rate him very highly. I genuinely think Stuart would be intrigued by the challenge. Stuart's humility is one of his greatest strengths, along with the fact that he is clearly an outstanding coach. I was intrigued to read Sam Burgess's thoughts on the 2015 World Cup, which he published on Twitter this week, alleging that "individual egos" and "selfish players" were to blame for England's pool-stage exit at the tournament, and had "cost the coach and other great men" their jobs. I don't know who Burgess was referring to. But what I do know is that Stuart has always been an outstanding coach. And when he is solely able to focus on that, the results speak for themselves. Leinster did lose their last Champions Cup match, admittedly, by a point away at Toulouse. But that is about all they have lost over the past 12 months. I cannot see them slipping up in terms of qualification. Toulouse are top of the group and look to have their swagger back. But they still have to travel to Dublin. It is a fascinating time of the season. I love this back-to-back European double-header. A couple of wins can set you up for the festive period and the prospect of qualifying for the knockout stages next year. A couple of defeats can effectively end your European run and leave you staring at a long domestic dogfight. It's real make-or-break stuff. Pool One, as I say, is intriguingly poised with Toulouse top on eight points. But they have a tough away trip to Wasps next weekend with Dai Young's team knowing that anything but a win will probably see them dumped out. And Toulouse know that they have Leinster lurking just two points back. Bath will have to play exceptionally well to get anything out of the European champions next Saturday. In Pool Two, Exeter are bottom but they have the advantage of playing Gloucester at home in the first game of their double-header. That is a real advantage in terms of building momentum. Gloucester have moved on this season, with Danny Cipriani obviously having made a big impact. Some of their rugby has been great. But Exeter will have their international contingent back. And after Premiership success in 2017, they are desperate to prove themselves on the European stage. I cannot see them slipping up. The other pool that catches my eye is Pool Five. Who could have foreseen that Newcastle would be top after two games? Their trip to Edinburgh on Friday night is another really interesting fixture. Richard Cockerill has done a wonderful job up there, but they are still not as consistent as Glasgow. I would not put it past Newcastle to emerge from it with the victory.